In this episode of triyoga talks, Dr Melody Moore speaks about the importance of self-love, how media myths perpetuate a sense of ‘not enoughness’ and the complex relationship between contemporary yoga and eating disorders. In this episode of triyoga talks, Vicky Fox talks about how to hold space and support people living with pain, how yoga can help with the physical, emotional and mental effects of cancer, and the positive power of community and sharing. In this episode, triyoga talks speaks to yoga teacher and TEDx speaker Max Strom on the ethics a yoga teacher should uphold, how breathing techniques can release feelings of grief, and how technology is driving us apart instead of bringing us closer together. Richard talks with us about yoga in the modern world, how traditional practices have evolved over the centuries, and whether there is really any such thing as authentic yoga. Sharon Gannon, the creatrix of Jivamukti Yoga, talks to us about yoga and veganism, the use of consent cards in yoga studios, what her personal sadhana looks like now and more. 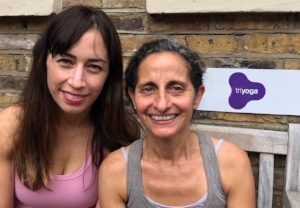 In our inaugural triyoga talks podcast, we speak with Yogaworks co-founder Maty Ezraty who tells us why advanced posture work alone cannot lead to enlightenment, when self-exploration shifts into self-absorption, and the effect social media has had on the yoga landscape.